A new medium - ‘Speedy Helping Hands’. We equipped some remote control cars with working gloves and towels to form a team of efficient floor cleaners. 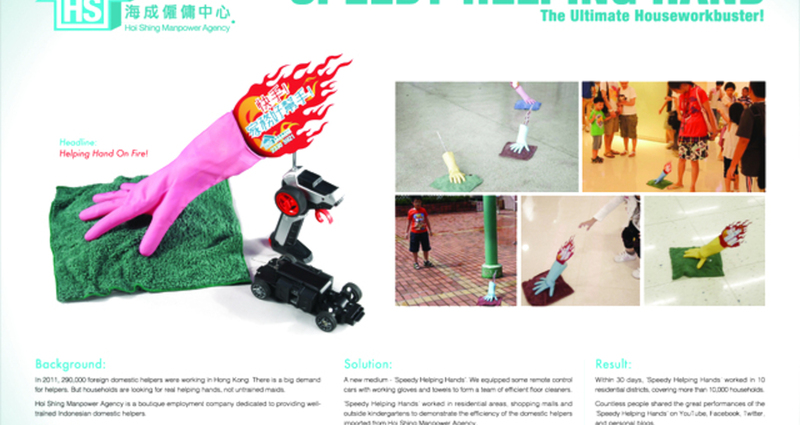 ‘Speedy Helping Hands’ worked in residential areas, shopping malls and outside kindergartens to demonstrate the efficiency of the domestic helpers imported from Hoi Shing Manpower Agency. This newly invented medium successfully aroused people’s interest and appealed to the target audience “in person” to communicate the high competence of domestic helpers from Hoi Shing. To raise awareness of Hoi Shing Manpower Agency - a boutique employment company dedicated to providing well-trained Indonesian domestic helpers - by targeting potential employers directly and maximizing their audience within a limited production and media budget.